Once, when I was a teenager tripped out on mushrooms, I was convinced I was invisible. I was in college. It was the first time I had ever tried mushrooms. I was in a car in a parking lot in front of an ATM machine. This was back in the early '80s when ATMs first came out and they had all sorts of bugs. I hated using them. To this day I don't have an ATM card. Anyway, my friends wanted to go into a bar and I was feeling like I couldn't be around people. So I sat in the car alone, in a parking lot in front of an ATM machine, and none of the people coming and going saw me sitting there, staring down the ATM. Except one guy. One guy saw me. I concluded he was probably invisible, too. Ahhhh, youth. I'm pretty sure taking drugs like that would kill me today...haha. But it's interesting, because invisibility has been a bit of a theme in my life. Some of it is imposed invisibility. The irony of being overweight is that some people tend not to look at you. Strangers, I mean. There's a whole portion of society that prefers to just...not see. There is a lot of prejudice. So you can be quite large and walk down the street and be invisible. That's really true of all of us. People generally don't acknowledge others anymore. They avoid making eye contact. I'm an eye-contact maker when just casually walking down the street. I have been a tall, fit babe walking down the street and a tall, fat old lady walking down the street, and the babe is nowhere near as invisible. Men make eye contact and smile, women notice you. Same person. Different bodies. Different responses. Not that I'm complaining. I sometimes wonder if I keep the weight on because being invisible is more comfortable for me. 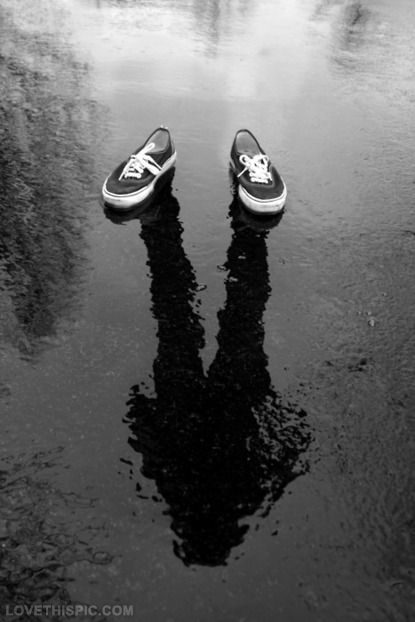 Truth is, invisibility is both a blessing and a curse. Sometimes it conjures times of emotional/social abandonment and being lost in the shuffle of my family and our nomadic lifestyle. Sometimes it conjures feelings of freedom and safety in my own little world. I have always been quite fond of my own little world. I wouldn't be surprised if my neighbors thought I was invisible. They never see me. I sneak in and out of the shadows of my hermit life. In fact, what got me thinking of it was that I sit on my porch most nights, a large woman with a large, handsome, fluffy dog—right there in front of a colorful house, set amidst a sea of ecru and white houses—and nobody ever sees me! Cyclists ride by, cars drive by, people walk by—people walking dogs that Kizzie barks at walk by—and nobody sees me! I mean, a few know to look for me there because they know me. But people are generally off in their own safe worlds. Not even the little boy I talked about a couple of weeks ago has ever noticed me. And I'll also say I'm invisible to the government right now. Nothing is going my way under Trump. My self-employed healthcare went through the roof recently. I earn too much for subsidies. I'm part of the middle class he swore to help. No surprise, but Trump lied and he made matters worse than they ever would have been had he not started undermining the ACA by removing subsidies that keep all of the marketplace low. I know better than to expect people to see me. Society is just that way. It's nothing personal about me. But I've been feeling especially invisible lately. And I see others disappearing before my very eyes in the current climate. Individuals no longer seem to matter much, and it troubles me. So I'm going to make more of a point to catch people's eye and flash them a smile moving forward. Like I said, sometimes I like being invisible and sometimes I don't. That's me. But those who don't like it might be feeling hopeless and lost these days and I want them to know they are seen. The government can change laws, sideline certain populations and put others at risk. Technology and cell phones can drive people into more insulated worlds. But nothing can take away our humanity and sense of community unless we let it.